Our mom has a notorious history in our household of having crock pot failures. It’s not her fault, but our crock pot cooks things quicker than most, resulting in overcooked food, and the many (many) crock pot cookbooks she has are mostly not too great. However, she recently bought the America’s Test Kitchen Slow Cooker Revolution cookbook, which is definitely a reputable book. 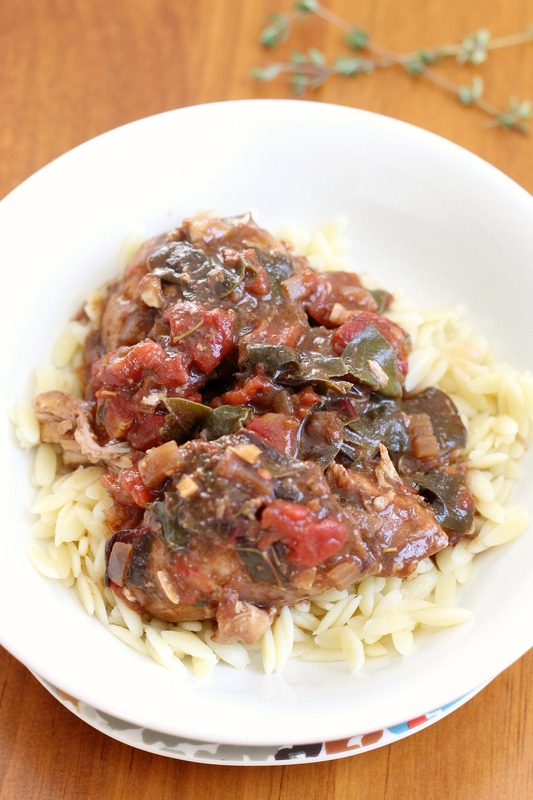 We had this amazing chicken for dinner on Sunday, and it was the first thing that came out of a crock pot in our house that tasted really, really good! (We had a few decent things come out of the crock pot before, but none that could rival something cooked over a stove or in an oven). 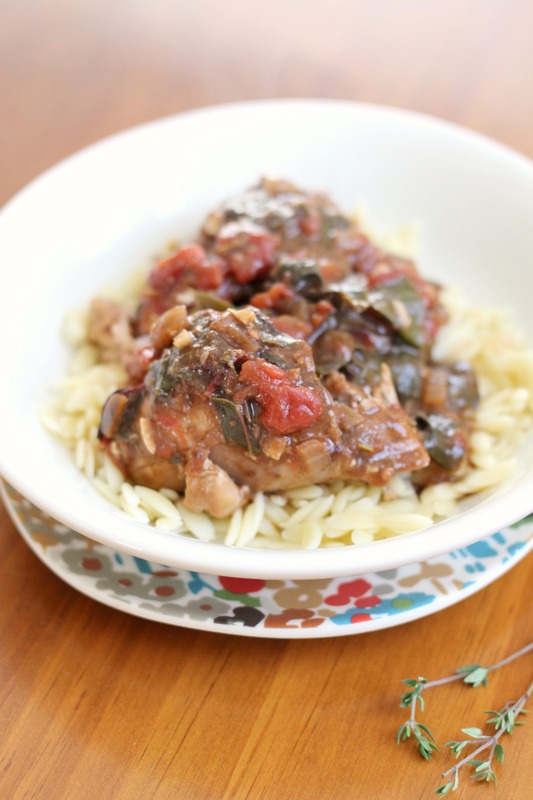 It’s super-flavorful and the chicken is tender and forgiving since it uses chicken thighs rather than chicken breasts, reducing the chances of dried-out chicken. We served ours over orzo pasta, which was great, but you could serve it over mashed potatoes or like a stew with a piece of bread on the side. Heat oil in a skillet over medium-high heat until shimmering. Add onion, thyme, tomato paste, garlic, anchovy, and red pepper flakes and cook until onion is softened and starting to brown, 8-10 minutes. Stir in flour and cook for another minute. Slowly whisk in vinegar, scraping up any browned bits and smoothing out any lumps. Cook until reduced a bit, about 3 minutes. Transfer to slow cooker. Stir in tomatoes, broth, wine, and bay leaves. Season chicken with salt and pepper and place slow cooker. Cover and cook until chicken is tender, 4-6 hours, on low. Gently stir in Swiss chard, cover, and cook on high until tender, 20-30 minutes. Transfer chicken to platter and tent loosely with foil. Let braising liquid settle 5 minutes, then skim fat from surface using large spoon. Discard bay leaves. Season with salt and pepper to taste. Serve with sauce spooned over each chicken piece. Enjoy! Thanks so much! I bet that they did adapt it from the cast iron cooker recipe. I’m sure we’ll be making it again soon, it was so good! Our mom particularly loved it.